The goal of this post is to look at the coming week for what we can expect and how to trade those opportunities. Last week was the first red week since the November 16th bottom. We closed the week right on the 50dma and under previous resistance at 1420. Volume has been constrained due to the typically light holiday season. If we are looking for historical precedence, the recent three-week rally is a spring chicken and it takes far more selling than we saw on Thursday and Friday to kill a normal up-trend. 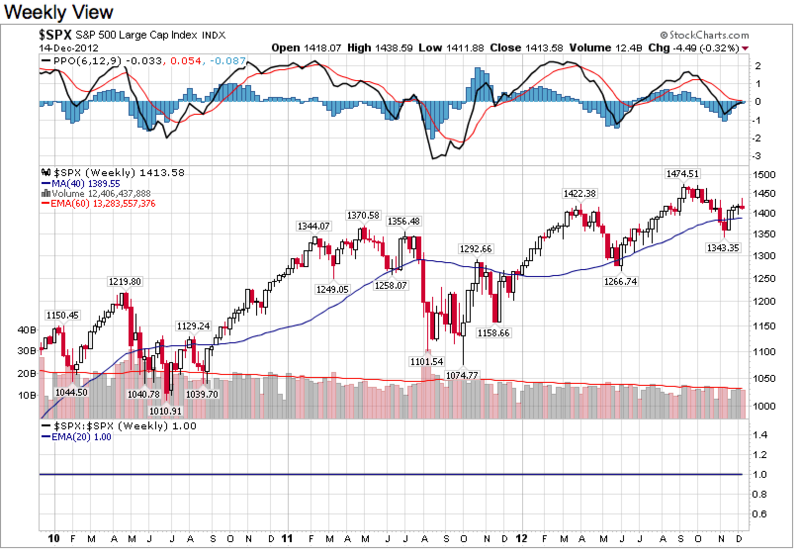 But that is assuming we are in an up-trend and this three-week rally is not simply a dead-cat bounce on our way lower. There are a lot of people on both sides of this half-full or half-empty debate. In fact the market price always seeks the perfect balance point between these two warring factions. If the slightest imbalance develops, prices move a few pennies one way or the other to regain this perfect balance. Repeat this process thousands of times a day and now you know what makes intra-day prices go up and down. What appears like random noise to the untrained eye is really tiny movements the market makes to maintain this perfect balance between half-full and half-empty. Why this matters is if we don’t have a tactical edge on other market participants and are simply trading the same information and techniques everyone else is using, it is impossible to do any better than random luck. This is a tough idea for most traders to swallow, but the truth is you have to do things differently than everyone else to make money at this game. If your typical yearly performance is close to what the indexes do, that shows you don’t have an edge on the market and your trades are simply winning and losing due to random luck. You win some, you lose some, and at the end of the day are not that far off from the market averages. It took years of studying the market and analyzing my performance for this to dawn on me and almost every trader I share this idea with resists it initially. Maybe that is because we all came to the markets because we think we can beat them. But the truth is, to win at this game we need a unique advantage. We need to exploit a market crack. There are several cracks in the efficient market hypothesis to choose from; structural, information, emotion, and non-profit motivated. At some other point I’ll dig more into these areas, but the main focus of this blog is exploiting the human aspect of markets and profiting from crowd psychology. The reason I bring this up is a lot of people are expecting the market to implode. They cite the Fed’s money printing, US federal deficits and debt, the Fiscal Cliff, Euro Contagion, and a slowing China. But the reason I don’t pay much attention to these ideas is because everyone knows about them. Every bear on the street will cite the same reasons, ones that have been dissected ad nauseam in the media for years. The only thing that scares me are the ideas no one is talking about, and so far I have yet to come across a bear with a unique and unexpected reason for the market to fall apart. Lets use the 2008 financial meltdown as an example since that is the most recent major market crash. In the fall of 2008 most pros on Wall Street didn’t know what a Mortgage Backed Security or Credit Default Swap were. Even the bankers in the middle of this mess didn’t have a clue what was going on. It wasn’t until the global financial system was brought to its knees and stock prices were cut in half did main street even get a whiff if what was going on. Now lets contrast that with the situation we are in now. When a barista at Starbucks is worried about something you know you can safely discount it because it is already accounted for and priced in the market. Anyone remember all those planes falling out of the sky because of Y2K? While it is a joking matter now as we ridicule the paranoid people who stockpiled a year’s worth of food and water in their basement, that doesn’t diminish the seriousness of the threat. Y2K was a very real problem, but what ultimately made it a nonissue was everyone talking about it. Knowledge is power and when we recognize a problem before it happens, we are really good at mitigating it. Everyone and their grandmother knows about the Fiscal Cliff, Debt Ceiling, Slowing China, prolific US Deficit Spending, Global Money Printing, Euro Contagion, Greece, Italy, Spain, Ireland, Portugal, and the rest. But the great thing is we recognized these problems early and the smartest minds in the world are hard at work solving them. For example Europe has teetered on the edge of collapse for three years, yet somehow they keep chugging along. That is because they recognize the problem and working to fix it. Going back to 2008, no one had the slightest clue what was going on including the most savvy people on Wall Street. Bear Sterns was a $62 stock just days before JPM offered to buy them out for $2 a share NFLX and GMCR have had spectacular declines recently but very few blue-chip stocks can drop 97% in one week! And so where does this leave us with our current predicament? While it doesn’t feel right and it is a bit scary, we can safely ignore all the reasons bears are using to justify their bearish predictions of doom and gloom. Now don’t get me wrong, the market can selloff and it can crash hard at any time, but I know it won’t be for any of the reasons people are currently talking about. Ignore what everyone is talking about and fear what is unseen. Going into this week we can do one of three things; up, down, or sideways. While not particularly helpful when looked at that way, when we break those scenarios down in greater detail we can formulate a plan. We can bounce near the 1400 level that has provided reliable support going back to August. This would represent a minor reset of an otherwise bullish rebound. There is still a lot of fear in the markets and it is often said markets climb a wall of worry. This pessimism will continue the fueling the next rally. Look back to Saturday’s post for an explanation on why this happens time and time again. And lastly we can selloff aggressively to the 200dma. If we can’t find support at 1400, expect the market to push on through to 1390 and even a little under before finding support. This is about as low as I expect a selloff to get unless something new and unexpected develops. Potentially we could retest 1350 if the market panics over a Fiscal Cliff breakdown, but that emotional selling creates buying opportunities because the fiscal cliff is a well understood event and the market rarely plunges on what it can quantify. Markets fear the unknown, not the known. A great example of this was this summer’s big rally on the heels of the SCOTUS ruling upholding Obamacare. So how do we trade these? Expect some near term weakness, but we should find a bottom not too far from here. There isn’t a lot of downside left to short, so if you have short profits, look to cash them in when we push down to the 1400 level. While we might drop to 1385, holding out for those last few points of downside is just greedy and foolish. It is easy to make money in the markets, the hard part is keeping it. Don’t be tempted to hold too long and give back all those hard-earned profits. On the long side, don’t try to pick a bottom and let the market find support in the 1400ish range before buying in. And of course I reserve the right to be completely wrong and change my mind in a moment’s notice. Always be on the lookout for behavior that doesn’t confirm to what you expect because it means something has changed and you need to change with it. It is okay to be wrong, it is suicidal to stay wrong. 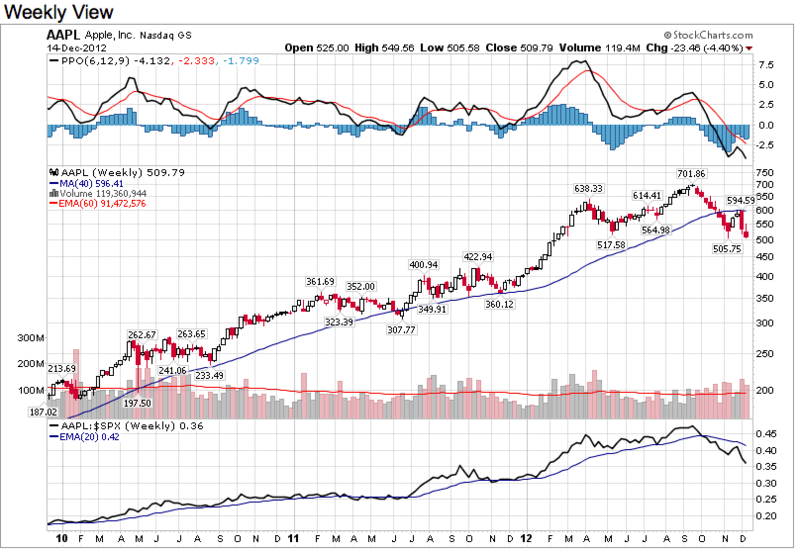 A lot of the above analysis applies equally to AAPL. It is way late in the game to be short and if you are lucky enough to be sitting on short profits, lock those in quick. We might see a dip under $500 on tremendous volume, but that will likely be the capitulation point if we didn’t already see that with Friday’s huge selloff. But either way there is very limited downside remaining in AAPL and it is time to reel in those short profits. For the bold with a long-term view, you might consider accumulating shares here if you are willing to sit through some near-term volatility. AAPL could shoot itself in the foot with its 4th quarter earnings, but the thing about the nearly 30% selloff is most of that downside has already been realized. There is plenty of chatter about suppliers being told to slow production because of slow iPhone5 sales, but I’ll be honest here, if I heard that, then everyone knows it and it is already factored into AAPL’s price. AAPL wil eventually succumb to competition like every other tech company has, but the reports of AAPL’s death are greatly exaggerated.